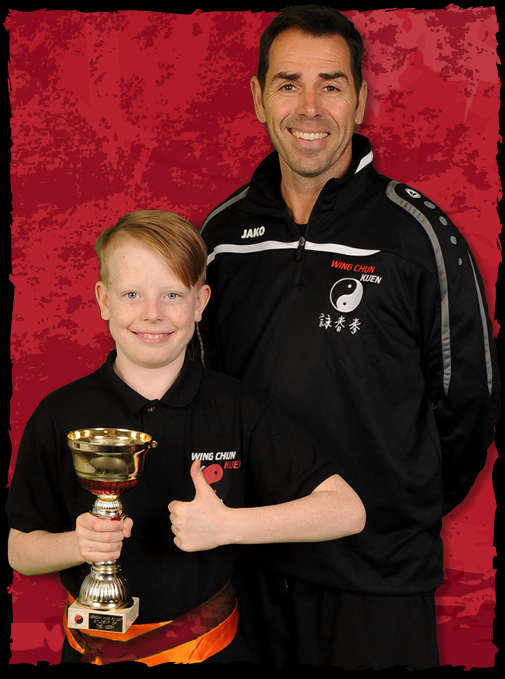 JUNIOR WING CHUN: Children between the ages of 8 and 16 are at a very important stage in their life. With the dream and haunts of being a teenager, there are many physical, emotional, social, and intellectual challenges that they face. With the right developments and positive reinforcement, your child will face their transition as a teenager with an enthusiastic outlook. The programmes are innovative children’s martial arts programmes that are specifically designed to challenge and develop the skills of pre-teens & teenagers. They target the characteristics of pre-teens & teenagers to help them develop physically, emotionally, socially, and intellectually. They learn and grow through martial arts training. Your child will build dynamic martial arts capabilities while gaining courage and confidence, and they will learn how to think smarter and harder than children of the same age. We will help mould your child into a leader, a thinker, and a character that brings out the best in his or her personality. Martial arts capture children’s undivided attention as they practise to perfect each technique. Initially, new recruits come along on a 4 week beginner’s course. On completion, students are able to participate in regular weekly sessions. Each week, students learn a new technique and skill within their belt status. Once all the techniques within their belt status are taught and understood, students are able to grade for the next belt within the system. At the end of every school term, students are able to enter into non-contact regional tournaments with medals and trophies for ALL. On completion of the programme, students are fully equipped to move to the Teenager or Adult Programme respectively. These programmes are specifically designed to target the stages of development of 8-12 & 13-16 year olds. The curriculum in the Junior and Teenager sessions follow years of research and development which are proven effective for these age groups. A fantastic martial arts training course that focuses on building Junior and Teenager capabilities; physically, emotionally, socially, and intellectually. Children this age are in a unique growth period in their life. They are refining the skills learned throughout their lives and Wing Chun kung fu will enhance this growth in the skills of focus, teamwork, control, balance, memory, discipline, fitness, and coordination. Our programmes are also designed to help combat and avoid bullying by teaching students how to defend themselves. Each month students are taught two new, age-appropriate and specific techniques that will develop their confidence and build solid skills. By the end of a year, the students are in an incredible position to be able to defend themselves proficiently in many situations. Traditional material – this includes basic martial art moves, self-defence, and forms. Traditional techniques are the basic punches, kicks and blocks. For self-defence, they will learn to protect themselves. They will also master new forms to develop focus, power and concentration – each new form will be more challenging than the one before. Chi sao training – this includes the competitive hand-to-hand application of their martial arts training in a controlled manner. This portion of the training is the most fun for the students, especially as their skills improve. Physical development – it is the most sustainable part of anyone’s health to maintain physical fitness. The sooner a child learns the benefits of fitness and has a regular fitness schedule, the more likely they are to continue this into adulthood. The 8 fundamental skills selected for the programme are broken down into specific requirements that each student must tackle at every belt level. 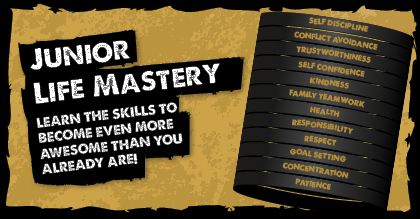 There are different belt levels to achieve, and your child will practise all 8 skills whilst learning martial arts. This means your child will be sharper, more focused, and better developed physically, mentally, emotionally, and socially than a child who does not participate in a structured programme. The purpose of focus in the curriculum is to teach the student how to focus with their mind and body. The beginner level introduces them to the basic concept of keeping their eyes on the target. The intermediate level takes their skills a little further by having the student focus not only on the target, but on their technique of each kick and strike. The advanced level further enhances the focus skills by having the student execute techniques where they take their eyes off of the target for a second and then re-focus on the technique. The purpose of teamwork in the curriculum is to teach the student how to cooperate with others on various tasks. The beginner level introduces them to good working habits with other people. The intermediate level introduces the student to working in a team. The advanced level teaches them how to train with others whilst following the rules and maintaining good sportsmanship. The purpose of control in the curriculum is to teach the student how to have control of their mind and body. The beginner level introduces them to having control of their mind and body by responding quickly to commands whilst in motion. The intermediate level introduces the student to having control of their body when they are kicking and punching towards each other. The advance level teaches them how to have control of their strength when practising their self-defence techniques. The purpose of balance in the curriculum is to help the student master the skill of balance through increments of balance training that increases in intensity at each belt level. The beginner level introduces them to the components of balance and how to have balance using various kicks. The intermediate level increases in repetitions of each kick by double the amount from the beginner level. The advance level challenges the student’s balance skills by making them do 10x the balance requirements than that of beginners. The purpose of memory in the curriculum is to get the student familiar with remembering the basic martial arts techniques and how to perform the techniques appropriately. 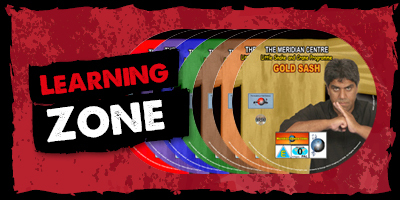 The beginner level introduces the student to the names and mechanics of the basic strikes, blocks, kicks, and stances. The intermediate level begins to test their memory by requiring them to perform random combinations. The advanced level challenges the student’s memory by requiring them to perform a structured combination of martial arts techniques known as a form. The purpose of discipline in the curriculum is to positively reinforce the importance of following rules, maintaining good behaviour, and performing at high standards. The beginner level introduces the student to basic commands and how to respond to those commands with good discipline. The intermediate level teaches them how to maintain good discipline without being distracted. The advanced level curriculum challenges the student to perform at high standards by displaying discipline of the mind and body. The purpose of fitness in the curriculum is to expose the student to exercises and activities that build strength and cardiovascular endurance. The beginner level teaches them how to run through basic exercise routines with the appropriate technique. The intermediate level exposes the student to intensity in their exercises. The advanced level challenges the student to demonstrate advance muscular strength and endurance in their regular exercises. The purpose of coordination in the curriculum is to teach the student left from right, and how to perform multiple physical tasks while maintaining good technique. The beginner level introduces them to basic coordination of jumping and moving in rhythm. The intermediate level teaches the student how to perform various combinations using both their left and right hands and feet. The advanced level challenges them to perform various techniques without losing coordination. If you can’t find the information you are looking for, please feel free to call us on 01702 391998 or drop us an email at hq.meridiankungfu@gmail.com.